1. Preheat oven 200°C, gas mark 6. Preheat a flat baking sheet. 2. Place the flour and butter into the bowl of a food processor and pulse together until the mixture resembles fine breadcrumbs. Add the icing sugar, egg yolk and one tablespoon of the cold water and pulse again. Add the remaining water and pulse until combined into a ball. Leave to rest for 30 minutes in the fridge. 3. Tip the pastry onto a lightly floured work surface and roll out to a 3mm thickness. Use the rolling pin to lift the pastry up and transfer it to line a 23cm x 4 cm deep loose bottomed, straight-sided tart tin. Press gently into the corners and leave untrimmed. Place in the fridge to chill for at least 30 minutes. 4. Take the pastry-lined tin out of the fridge, line the pastry with parchment and fill with baking beans. Place on top of the preheated baking sheet and bake for 10 minutes, then remove the beans and parchment and return to the oven for a further 5 minutes until golden. Remove from the oven and set aside. 5. For the filling, mix the cornflour, sugar and lemon zest in a medium pan, blend in 350ml cold water and the lemon juice, strained through a sieve to remove the pulp and pips. Cook over a medium heat, whisking constantly, until thickened and smooth (about 4 minutes). Remove from the heat and beat in the butter until melted, followed by the egg yolks. Return to a medium heat, keep stirring vigorously for a few minutes, until the mixture thickens and bubbles, then set aside to cool while the meringue is made. 6. Put the egg whites in a large bowl, beat with an electric whisk or stand mixer until stiff, add the sugar and cornflower slowly. Keep whisking until thick and glossy. 7. Trim the pastry base and fill with the lemon curd. 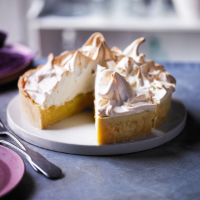 Top with meringue, starting at the edges and working in. 8. Place back in the oven for 10 minutes until crisp and golden. Leave to cool completely. This recipe was first published in Thu Feb 19 16:55:00 GMT 2015.